Detached, sea front, right on Woolacombe’s renowned Esplanade enjoying views over the beach and across the sea at Combesgate, what more could you want?! 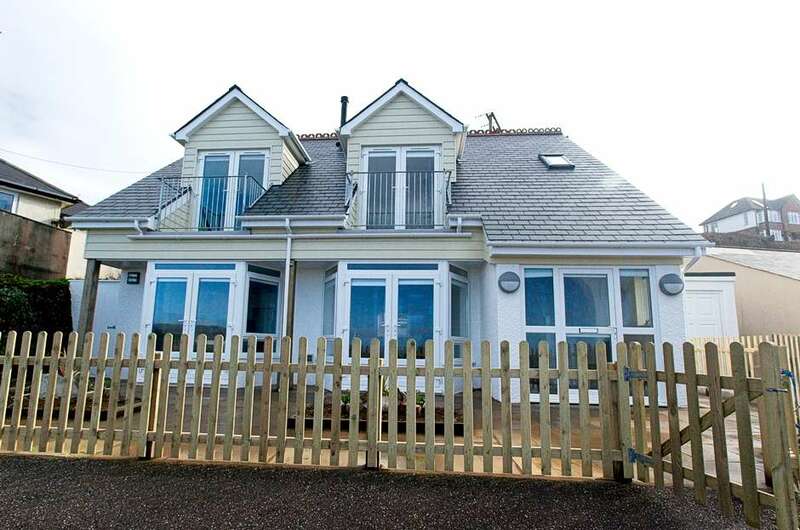 This recently refurbished quirky seaside holiday home has ample parking and takes dogs. Here are a choice of two different entrances, either straight into the hallway or into a covered area between the garage and the cottage which is great when returning from a muddy dog walk or with sandy feet after a surf or day on the beach just paces away. I love this place; it has views from almost every room and just seems to tick every box. As it has just been extended and refurbished it is newly decorated throughout in a contemporary way with a bright white back drop with an occasional splash of colour carefully introduced in tastefully carefully chosen furnishings. The super aubergine leather corner sofa sets the colour theme in the main living room with matching leather swivel armchair by the patio doors to take in the exceptional view across to the sea. This room has a gas flame effect wood burning stove in the fireplace, a wall mounted large flat screen TV, DVD, and coffee table. There is free Wi-Fi. Off this room is the utility room with wet room style shower, ideal for rinsing off the dogs or sandy feet. With washing machine and separate tumble dryer, a sink, work surfaces and storage, this room is a real bonus to any holiday home. The bright kitchen is fresh and white with one feature wall in a bold bright blue and white gloss slab kitchen units housing small size dishwasher, fridge, freezer, oven, hob and extractor. There is a microwave and plenty of worktop and storage. In the bay window overlooking the front terrace and the sea is a gloss white round table and 6 leather chairs in alternating white then aubergine. Simply gorgeous! Downstairs there is a double bedroom with clothes storage and en-suite shower room. This room is at the back of the house with no sea view but a window to the rear. In the hall is a door to a cloakroom with WC, sink unit and coats hooks. From the hall stairs rise to the first floor which is the new extension and has two bedrooms, the master is en-suite and a family bathroom with bath and shower attachment, sink vanity unit and WC. The landing area has a large apex window with patio doors to a balcony and has 2 armchairs and telescope to sit and watch for dolphins, sea birds and just gaze at the ever changing sea and surf just over the road, magical! The master bedroom has a king size bed, wardrobes and clothes storage, huge full 4 piece en-suite with shower, WC, bidet and sink unit. The apex has patio doors to another balcony overlooking the sea! The twin room is a good size with twin divan beds, chest of drawers and bedside units with lamps. 1 - 2 small/medium dogs are accepted at £20 per dog per holiday (please check with us re size of dogs before booking). Plenty of parking for several cars and a small garden at the front overlooking the sea with room to BBQ. The enclosed gated terrace at the front of the house is ideal if you are brining your faithful friend or young children as the sloped driveway to the house is shared with the house next door and is not gated. All in all this super seafront holiday home should bring a smile to anyone’s face as it represents everything you could want from a holiday home in the UK.